Conservative commentator Ann Coulter has canceled a planned speech she was due to deliver at the University of California at Berkeley after the school’s management said they could not provide a safe venue at the campus. Coulter was due to speak at the Sproul Plaza on Thursday after being invited by the Young America’s Foundation (YAF) and BridgeUSA to talk about immigration. Sproul Plaza is where the Free Speech Movement led by student Mario Savio began in the 1960s. "There will be no speech," Coulter wrote in an email to Reuters, accusing the YAF and BridgeUSA of betraying her. "I looked over my shoulder and my allies had joined the other team," she added. Some conservatives on Twitter reacted with anger and dismay to the news. @FoxNews@yo111481susan@AnnCoulter Berkeley is no longer an institution of higher learning. It is now a domestic terrorist training facility... just saying. Even some opponents of Ann Coulter were upset at what they thought was a violation of free speech. I can't stand the despicable & nasty comments of @anncoulter, but NO ONE should be denied the right to speak, especially facing violence. A few, however, were pleased with the decision. Kudos to everyone organizing to stop Ann Coulter from spreading her fascist hate. Police were reportedly bracing for massive protests after Pranav Jandhyala, founder and co-president of BridgeUSA, told university police about Coulter’s plan to speak at the campus. “We’re worried about it turning into a huge battle between her security and conservative militia and antifascists and others,” Jandhyala earlier told the Daily Californian, a student newspaper. “It’s an issue that hits home for many of our students,” he continued. “Berkeley is a sanctuary city. We have many undocumented immigrant students. That’s why it seemed like a good issue to put on the table. YAF and the Berkeley College Republicans filed a lawsuit on Monday against several Berkeley administrators, claiming the university was stifling free speech at the school and failed to meet its demands for event logistics and desired safety precautions. “Though UC Berkeley promises its students an environment that promotes free debate and the free exchange of ideas, it had breached this promise through the repressive actions of University administrators and campus police, who have systematically and intentionally suppressed constitutionally-protected expression” by students whose views are similar to those of the plaintiffs, the lawsuit says. Last week, campus administrators proposed rescheduling the Coulter event because of safety concerns and ultimately moved back its invitation to her from April 27 to May 2. The lawsuit claims that the date coincides with “dead week,” when many students typically leave campus in May before final exams. Dirks previously said that he fully supports the right of students to host the speakers of their choice. The campus has become ground zero for confrontations between far-left and far-right supporters since President Donald Trump’s election win in November. Earlier this month, the university cancelled a speaking event by conservative writer David Horowitz. Horowitz is the founder of the Freedom Center, which has become identified as a supporter of anti-Muslim rhetoric, according to the Southern Poverty Law Center. The university recently hosted former Mexican President Vicente Fox, who spent much of his speech bashing President Trump. 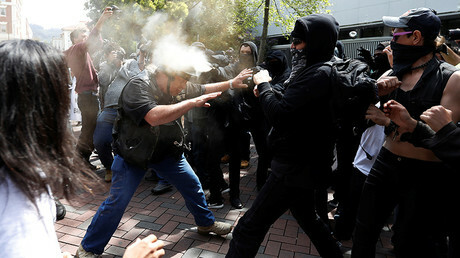 Last weekend saw another violent clash between far-left supporters and free-speech activists in the city, as anarchists attacked the ‘Patriot’s Day’ rally organized by Trump supporters. The rally was a follow-up to the ‘March 4 Trump’ last month, which also witnessed violence from anarchists, leaving multiple Trump supporters injured. 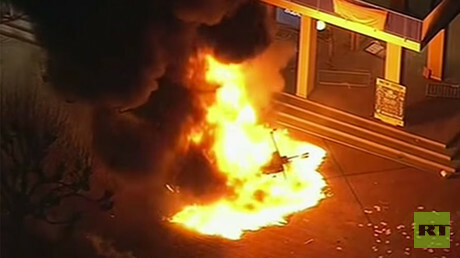 In February, a speaking event by controversial right-wing commentator Milo Yiannopoulos on the Berkeley campus was cancelled after protesters began throwing firebombs, assaulting attendees, and vandalizing the area. The problems are not exclusive to Berkeley. A day after Yiannopoulos appeared at Berkeley, 11 people were arrested outside New York University’s student center during violent protests over a speech by conservative commentator Gavin McInnes, as students and ‘antifa’ protesters clashed with Trump and McInnes supporters. Last week at Auburn University in Alabama, a fistfight broke out during protests when white nationalist Richard Spencer spoke on campus. Earlier this year at Middlebury College in Vermont, an angry mob of hundreds surrounded conservative author and scholar Charles Murray after he tried to give a lecture about his most recent book. Protesters, some wearing masks, climbed on the hood of his car and pounded on the windows as he tried to leave. Murray, a libertarian, has attracted controversy due to his 1994 book The Bell Curve, in which he argued with Richard J. Herrnstein that intelligence is a better predictor of many outcomes in life like financial income, job performance, unwed pregnancy, and crime than education level or parents’ socioeconomic status.